It's season again and you know what that means: lots and lots of traffic. Look, I'm no speed demon, but I've noticed something on our roads that gets worse every season. It seems drivers - especially those driving trucks - feel it's okay to use the left lane on our major roadways. A quick refresher course: The right lane is for those who are in no rush. The middle lane for those going the speed limit. The left lane for passing, racing, texting or whatever you're doing when the police pull you over. And by the way don't do any of that. But let's focus for a moment on the left lane - and if this is you, raise your hand. You're in your rig hauling palm trees, pickles, or whatever, and you're at the end of a long day working in the heat to support your family. There's a special place for you in heaven but the left lane is not it. You know who you are. In the driver's seat, looking out the window with that thousand-yard stare, oblivious to anything around you and chugging along at an impressive 25 miles an hour. There are so many great things about driving down here. When you're looking at your smart phone and the light changes and the person behind you waits a full minute and a half before bopping his horn. Or the especially courteous driver who stops a half mile before the cross walk and ways you on. Best of all we don't have to drive in the snow. 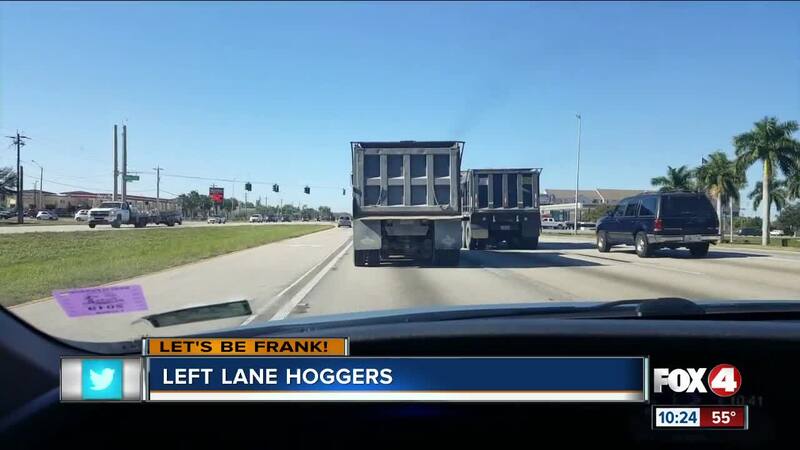 But those left lane hoggers make me nuts. Folks there are rules of the road. That's why they are called rules. We won't judge you by the lane you choose. Just choose the right one. I'd like to know what you think. Email me at frank.cipolla@fox4now.com.